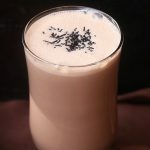 Ragi milkshake recipe a quick and easy chocolate flavored ragi milkshake. To a sauce pan - measure and add ragi flour and coco powder to it. Whisk well add water to it. Whisk well to avoid lumps.All this is done off the stove.Now switch on and cook until it becomes thick and shiny. It should coat the laddle like this.Switch off and cool down completely.Chill the milk atleast for 15-30 mins. Add chilled milk to mixer jar, add sugar and cooked ragi mixture. Add vanilla essence to it and blend it well until smooth and creamy.Chill it until serving time and Serve chilled. Serve with a garnish of chocolate shavings or chocolate semiya like how I did. If you dont want coco powder just add vanilla essence alone.But adding coco powder hides the flavour of ragi so kids will love it for sure. Adjust sugar according to your preference.